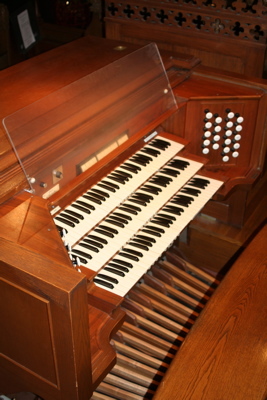 Early in 2004 Mike Foley of Foley-Baker Inc. was told of a 1929 Skinner Organ at St. Paul's Memorial Church, United Church of Christ, in Reading, Pennsylvania. The church was disbanding, the building had been sold to another congregation who no longer needed the instrument, and time to remove the organ before it was destroyed was nearing an end. So Mr. Foley, acting as a broker to save a piece of history was showing the instrument to any interested party. One day, while having lunch with a colleague in the organ restoration/building industry, Mike happened to mention the organ in Reading. Wheels began turning. The colleague was Jack Bethards, President of Schoenstein & Company of San Francisco. Mr. Bethards was a friend of James Wallace, then St. Mark's Organist and Choirmaster. 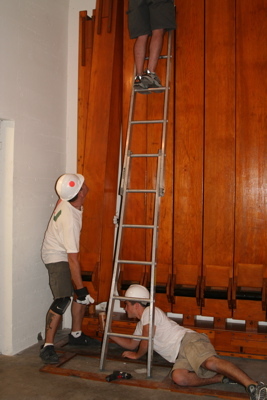 As an occasional consultant for our parish, Jack had taken James to see a Skinner organ at Occidental College, and knew St. Mark's 1973 Schlicker organ would soon need full renovation or replacement. Within a matter of two or three weeks, a bid was needed to save the Skinner in Reading. Within days, James Wallace and friend Peter Conte, Organist and Choirmaster at St. Clement's, Philadelphia, and the Wanamaker Grand Court Organist, made a trip to Reading to play and check out the instrument. What they found was an instrument covered with coal dust, yet in otherwise pristine condition: the organ was as Skinner had installed it in 1929, almost exactly. Mike Foley describes the event as, "We were bundled up in the cold of winter. The organ console was filthy, but even before Peter got to the console, his fingers were already moving he was so excited, anticipating the rich colors of the instrument." Peter played for nearly two hours while James and Kurt Mangel, Curator of the Wanamaker Grand Court Organ, crawled through the organ and examined it from top to bottom. Choked with dust in a room with dead acoustics, the organ sounded beautiful, and Kurt gave the thumbs up on the lasting integrity of its design and construction. When James returned to California and met with Fr. Mark Weitzel, David Lazier, Treasurer and others, they considered how to proceed. 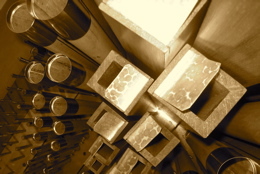 It would be possible to purchase the organ without an immediate plan of action of renovation and installation, but the decision to make the purchase was pressing. An agreement was reached that one person should be asked to help St. Mark's purchase the organ. If the individual said no, the project would be pursued no further. If yes, the organ would be purchased and the project put on hold until other funding was available to proceed with renovations. One question. One week-day morning in October 2004, as Fr. Mark was walking to his office after morning mass, Isabel Soule happened by, doing her Altar Guild duties. He asked if she had a moment to talk, and in his office, she contemplated. And Isabel said, "Yes." 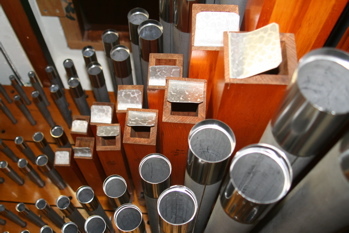 The Skinner Organ began its long journey to a new home. Beginning early in 2005, James established relationships with contacts at the Ahmanson Foundation of Los Angeles and the Joseph Bradley Foundation of Philadelphia, whose primary focus is funding restorations of Skinner organs. Grant proposals were submitted formally a year later, and both organizations committed to substantial gifts in the following years. Steps of faith over the past five years have been required and taken many times. The joyful giving of faithful people have offered an amazing cornucopia: excellent craftsmanship, grant writing, attention to financial details, vestry conversations, aesthetic considerations, hours of practice, hours of prayer, clear and direct project management, encouragement and Thank Yous, attention to measurements and varnishes, skilled ears for tuning and regulating, brute muscle strength and steady hands, financial gifts given, appreciation for Earnest Skinner's genius and ingenuity, and freedom to smile and marvel at God's work. We are truly fortunate to be the beneficiaries of such a kind and generous instrument.